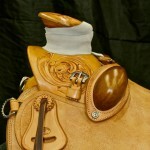 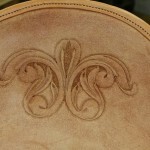 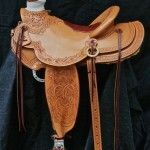 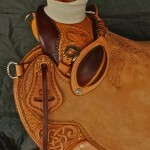 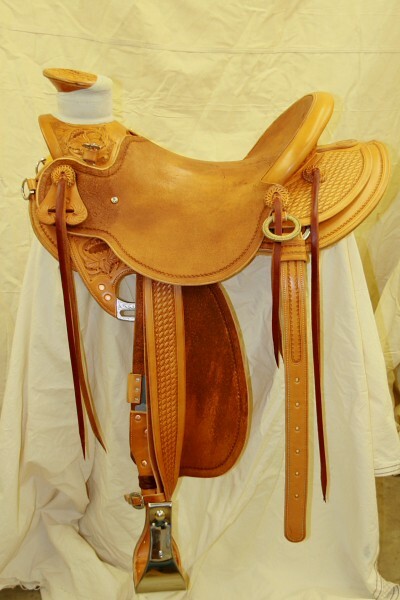 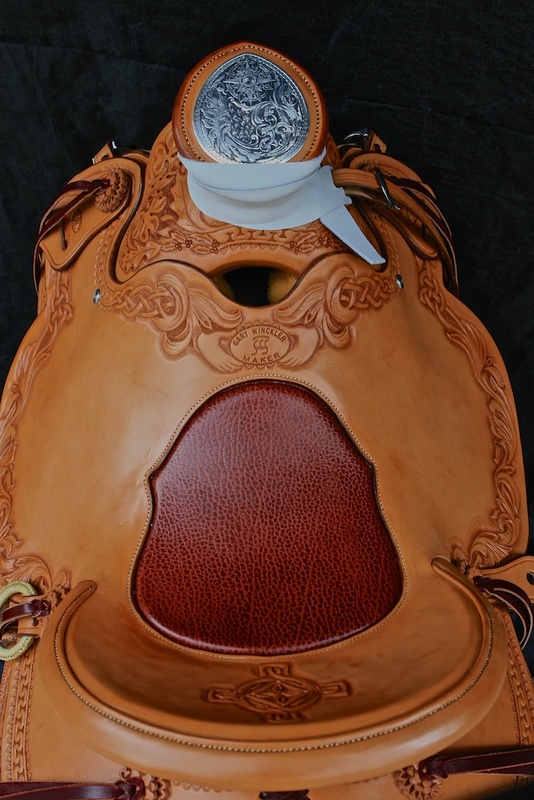 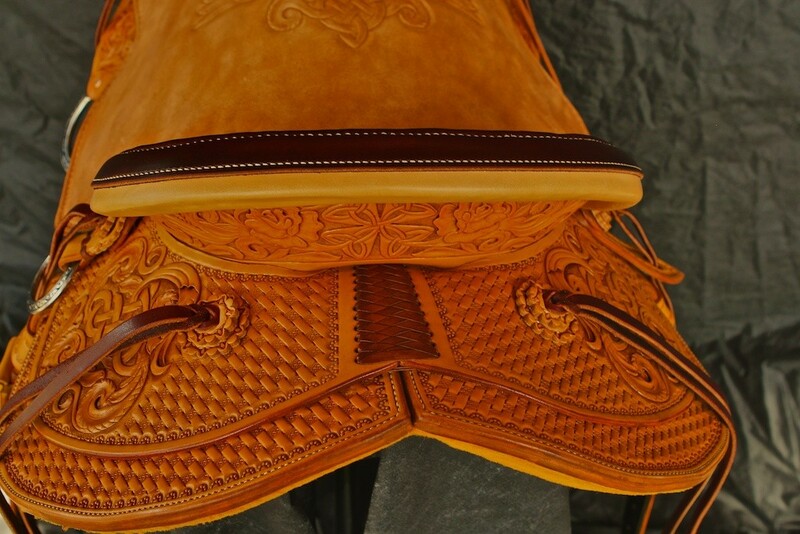 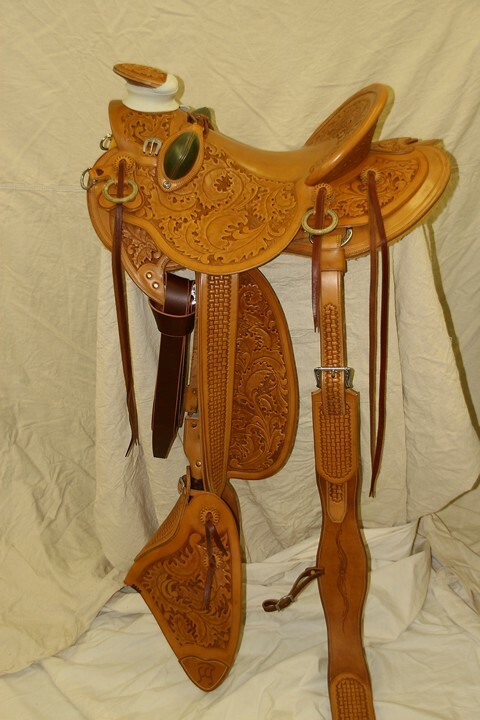 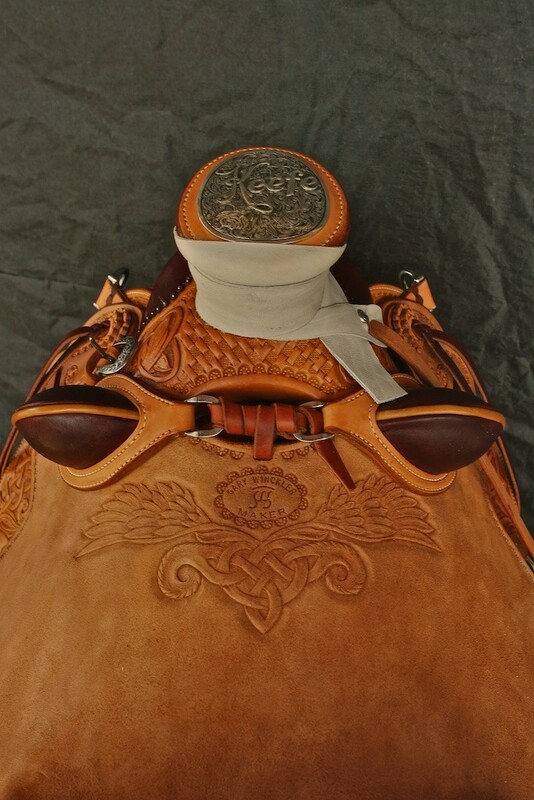 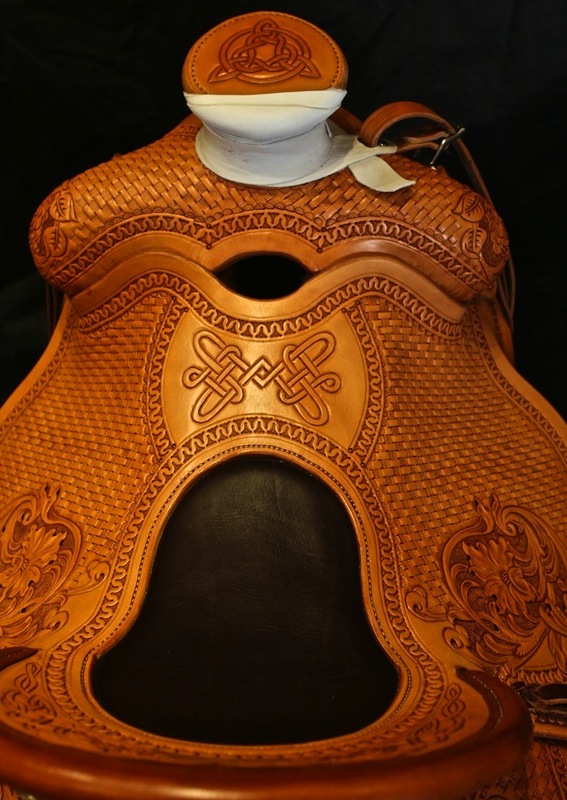 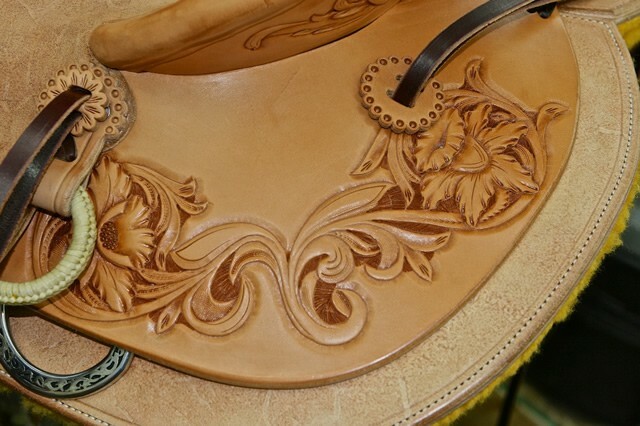 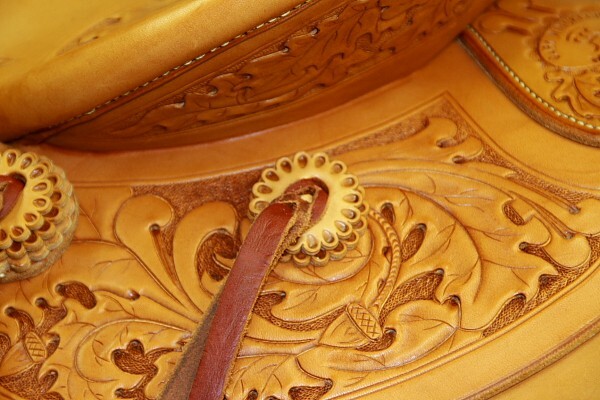 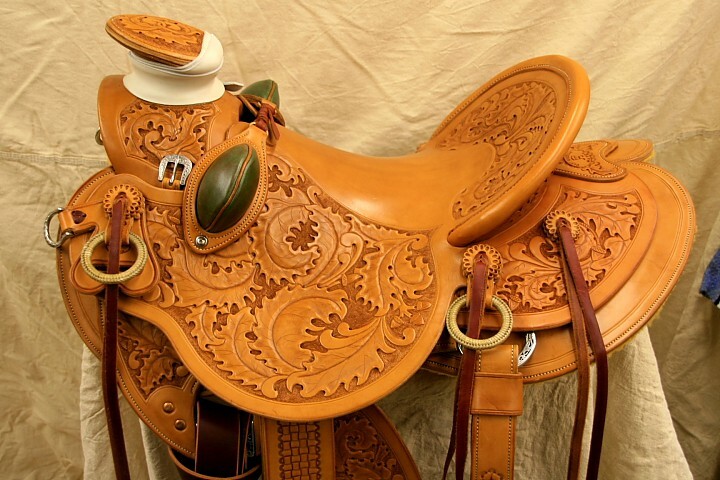 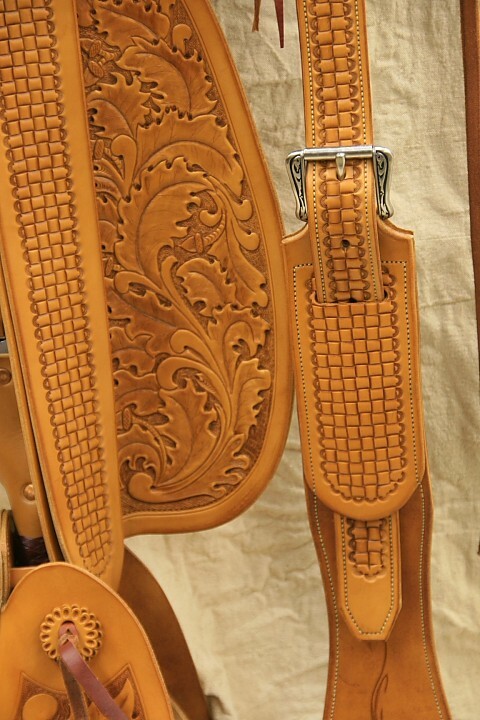 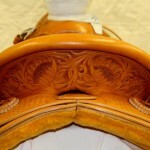 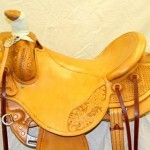 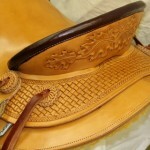 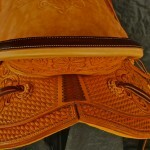 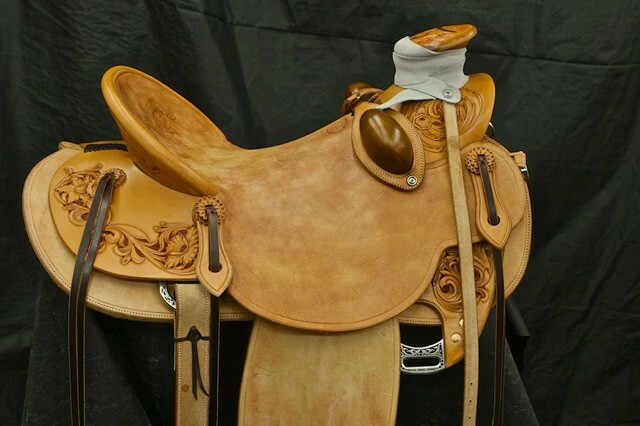 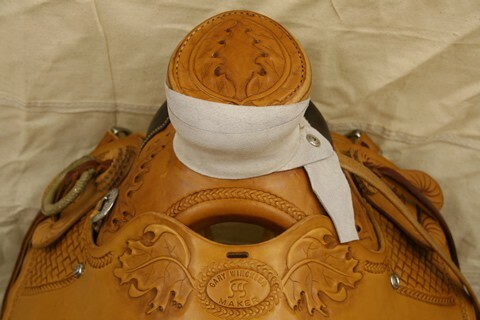 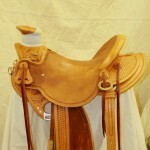 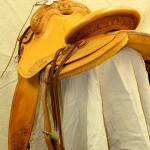 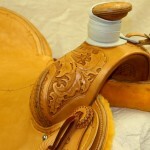 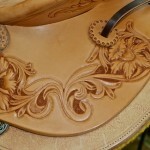 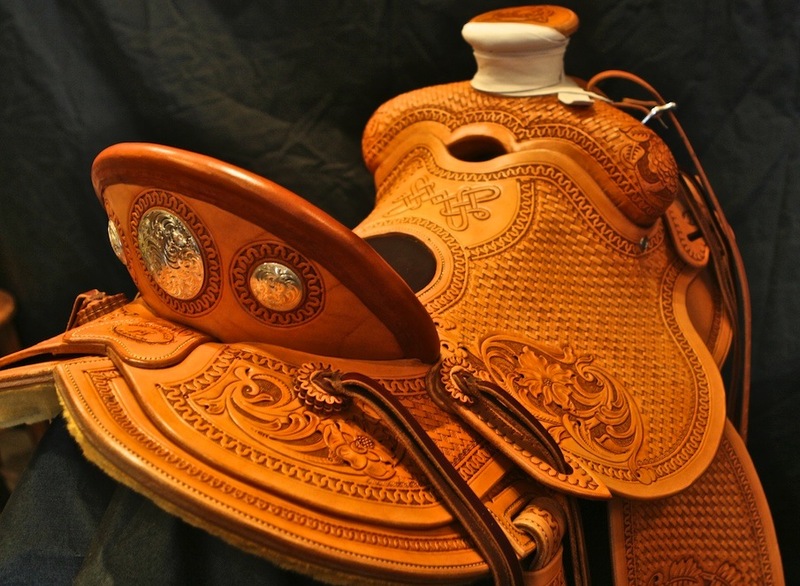 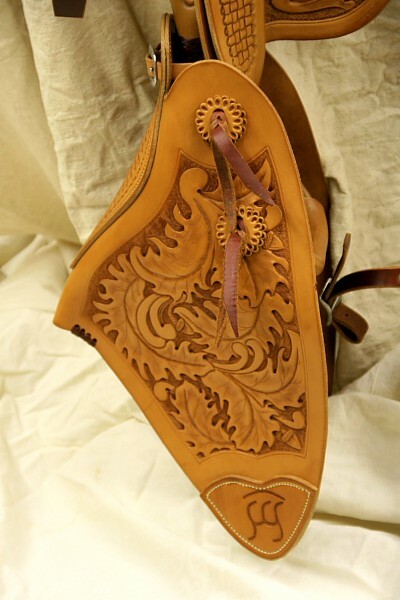 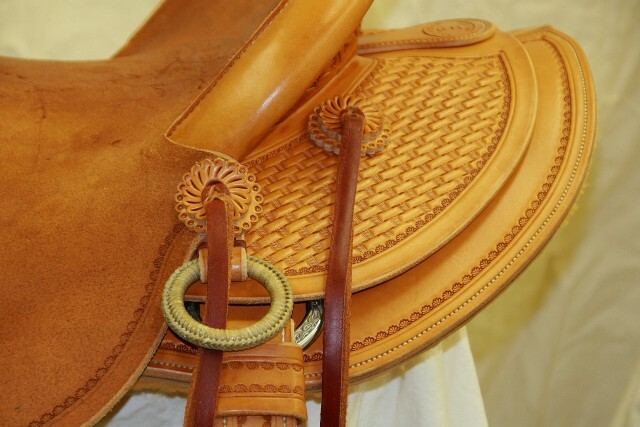 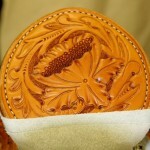 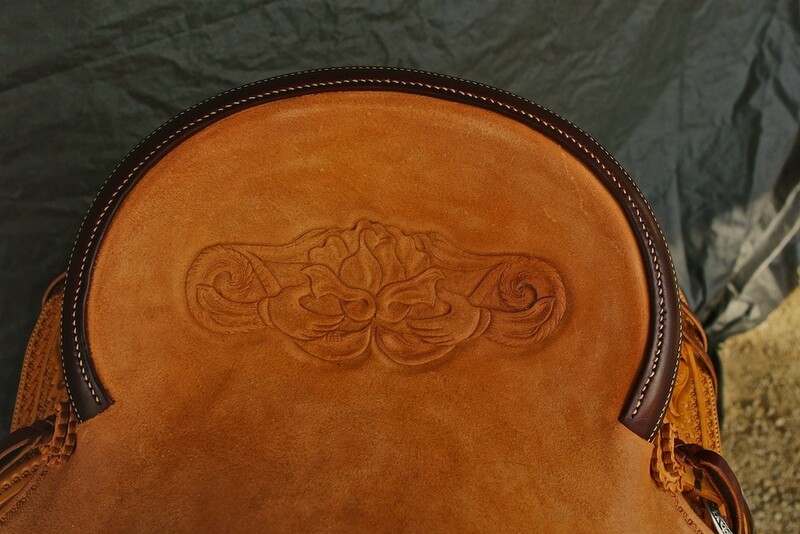 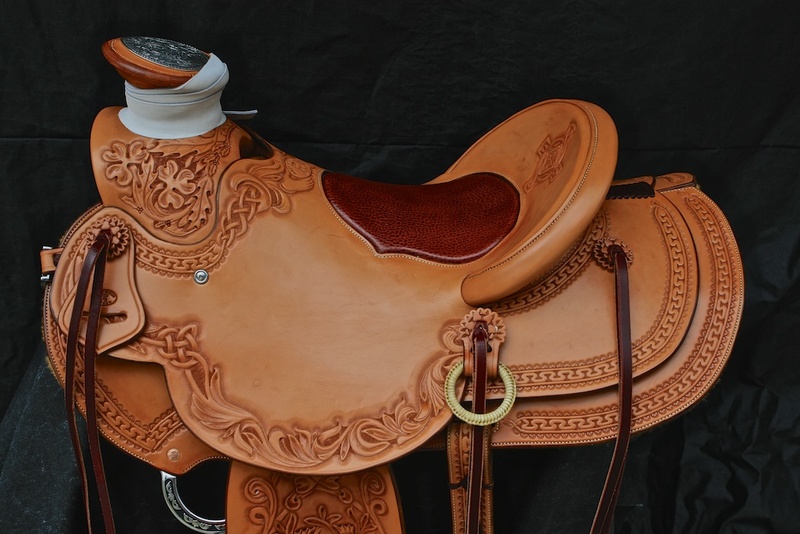 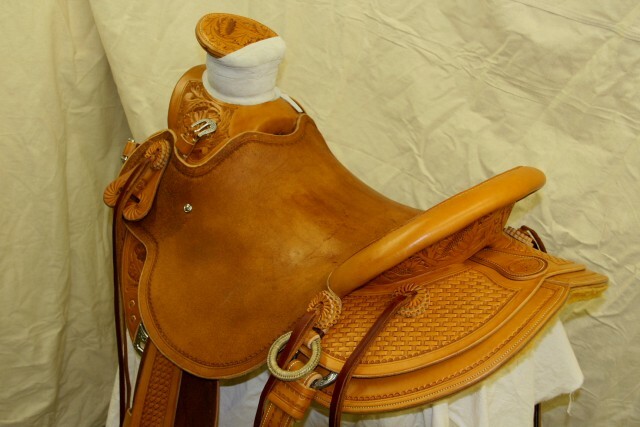 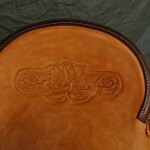 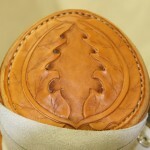 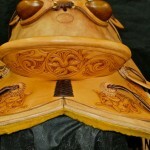 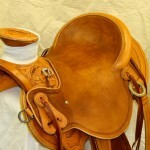 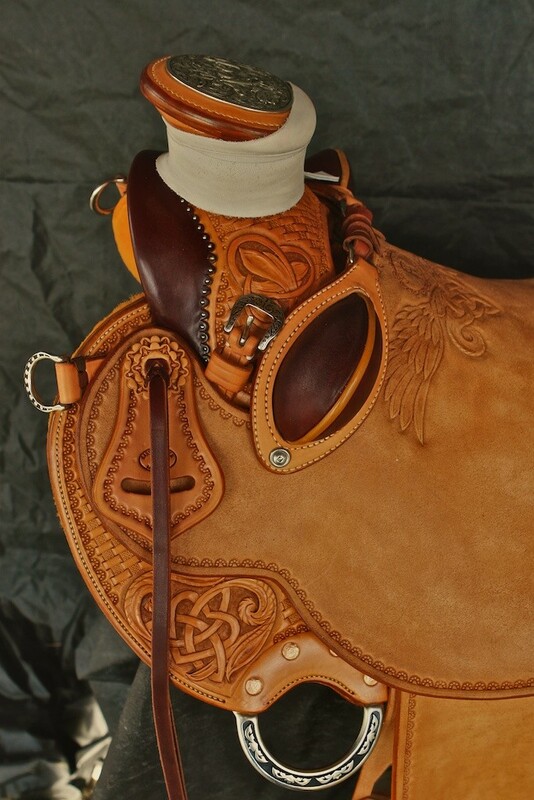 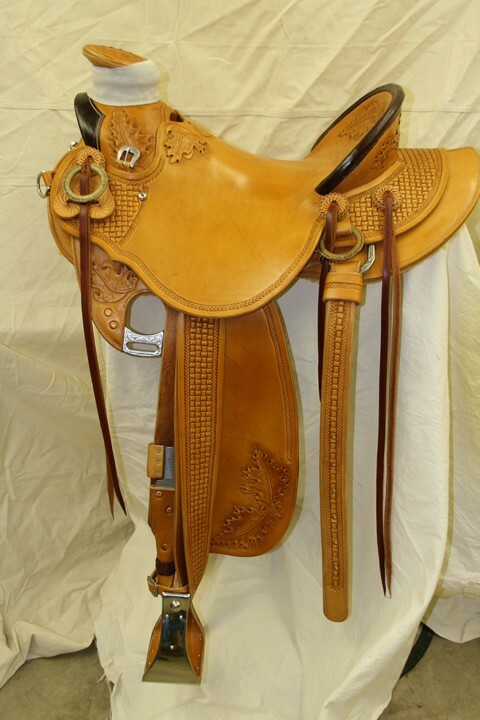 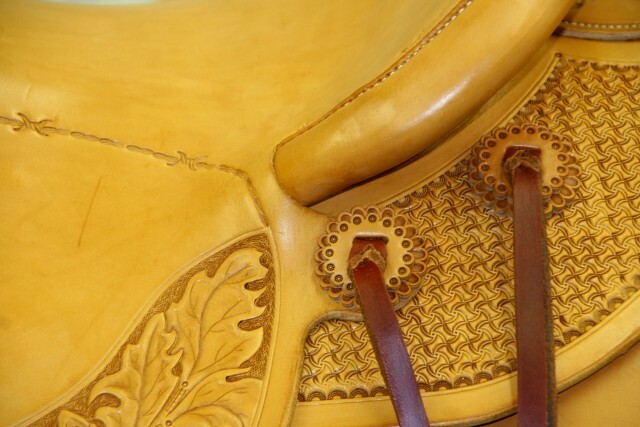 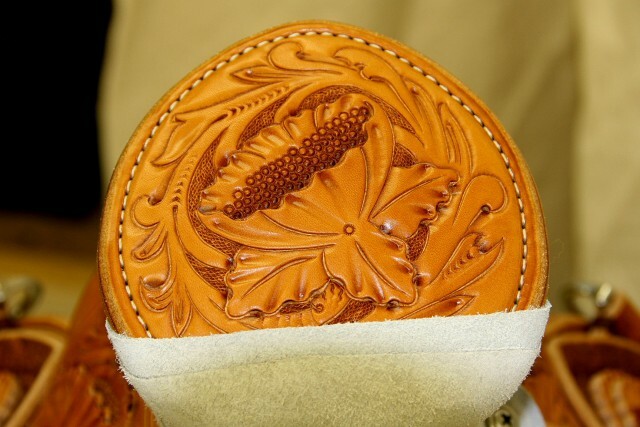 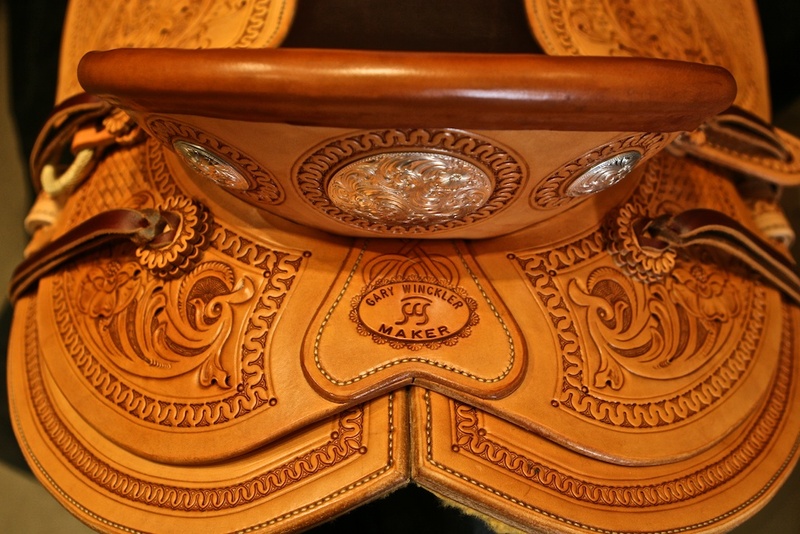 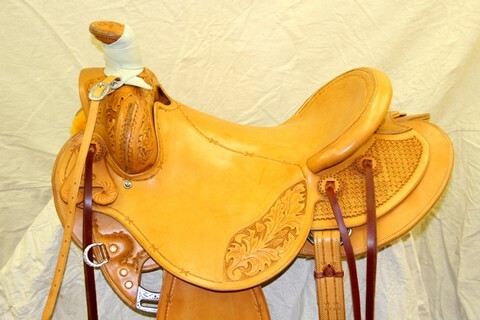 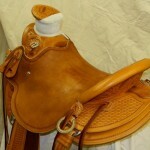 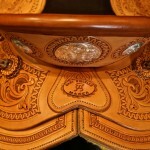 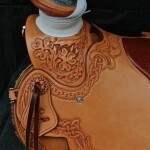 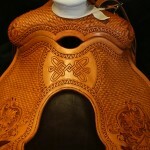 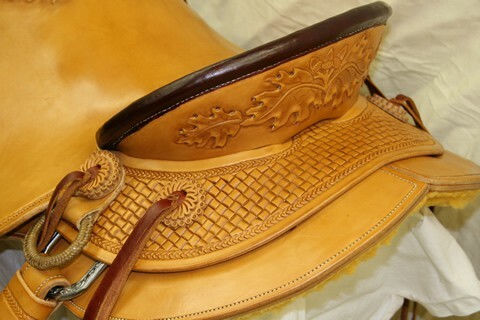 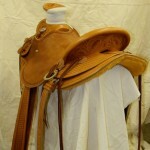 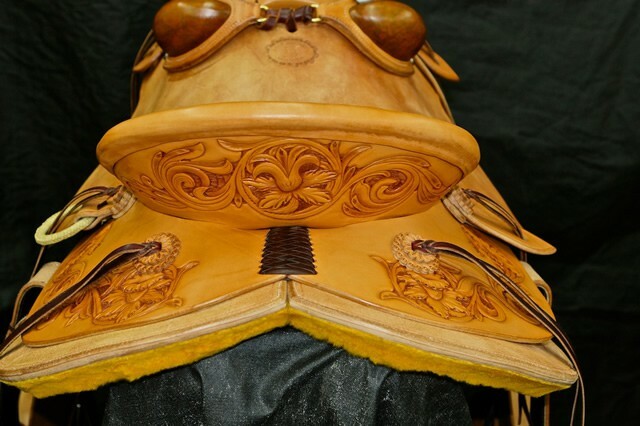 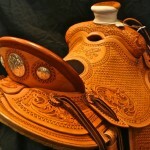 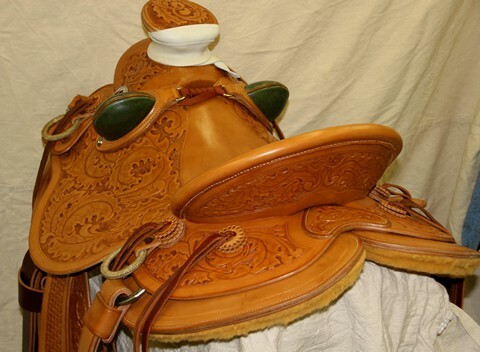 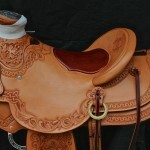 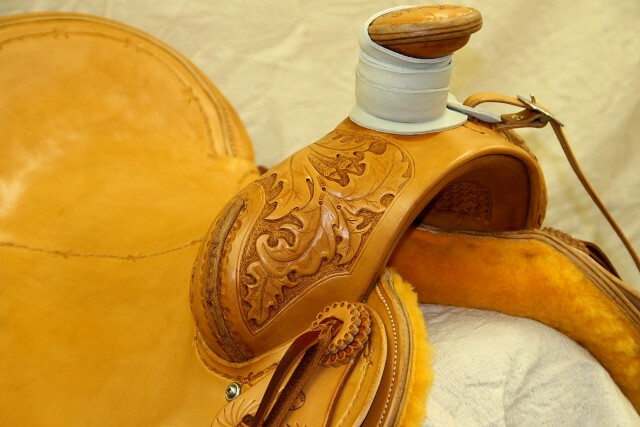 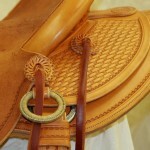 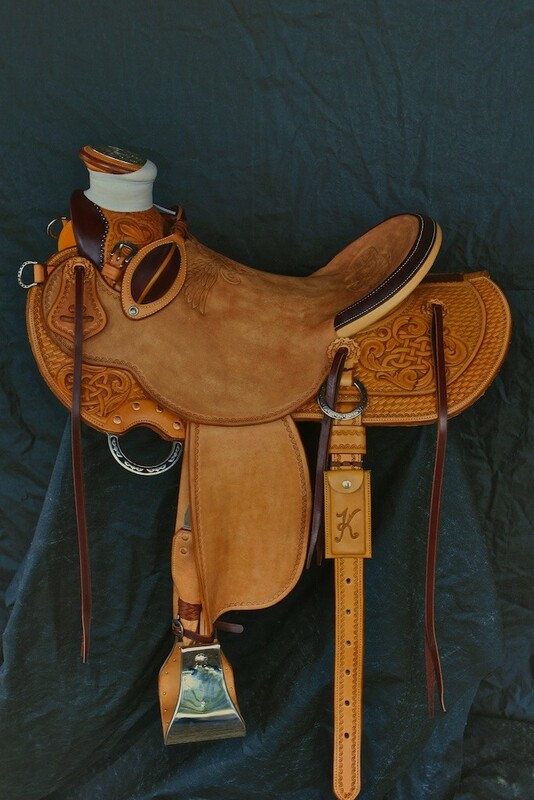 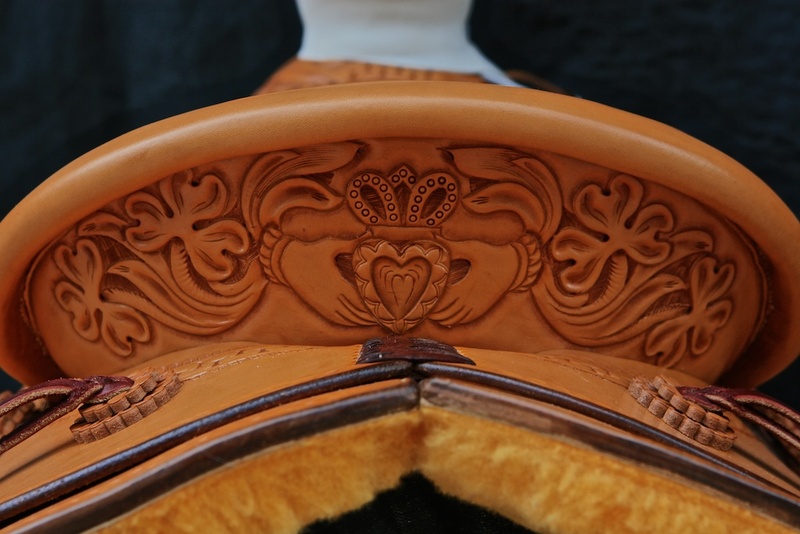 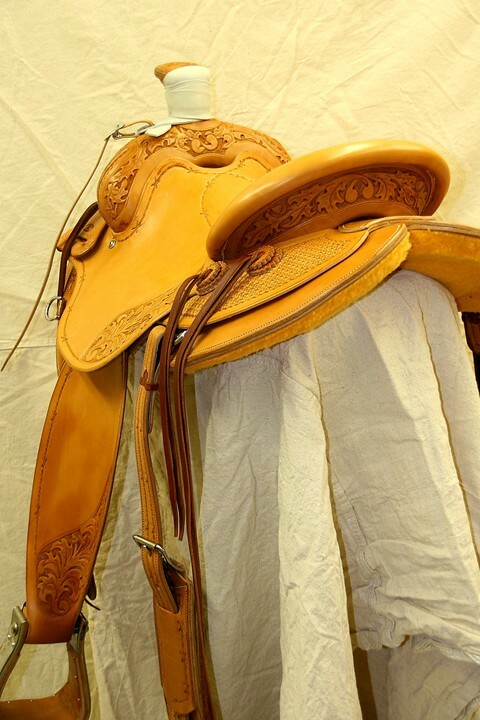 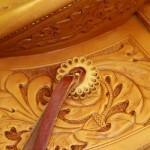 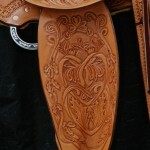 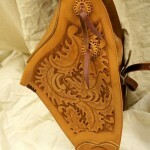 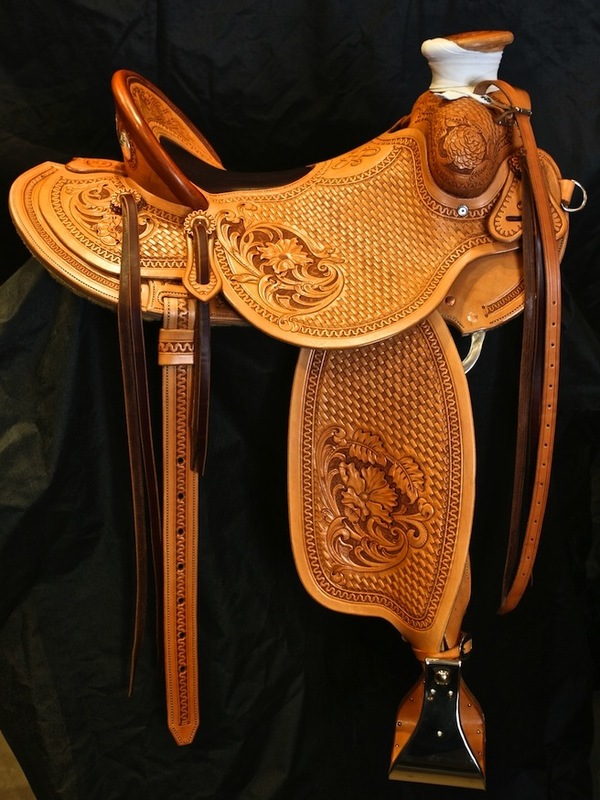 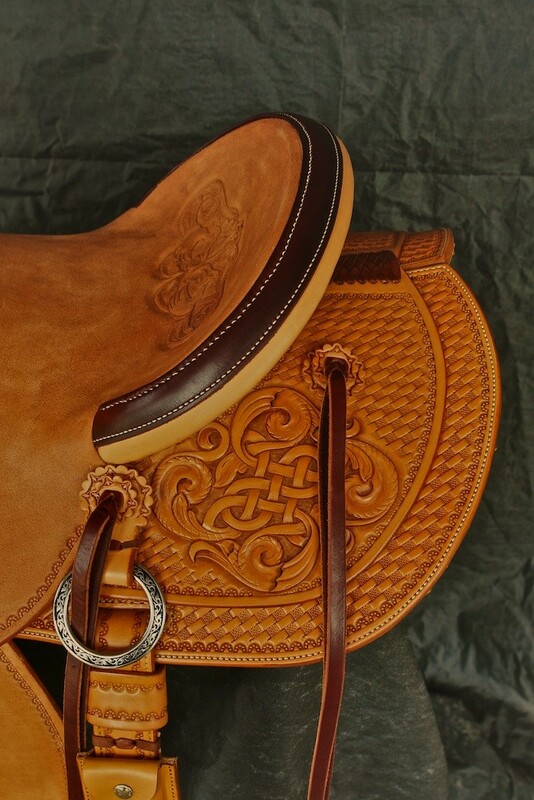 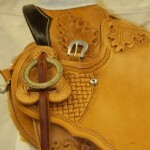 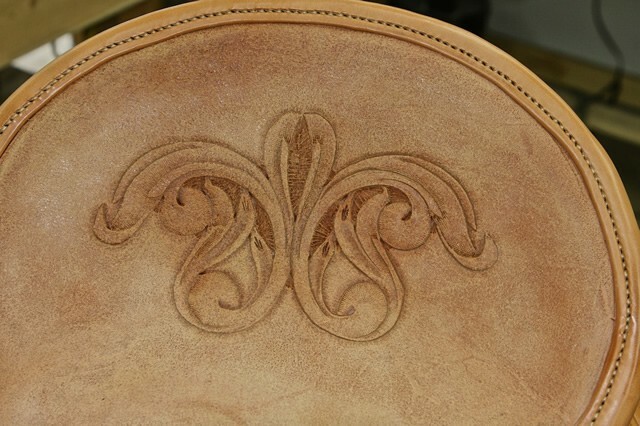 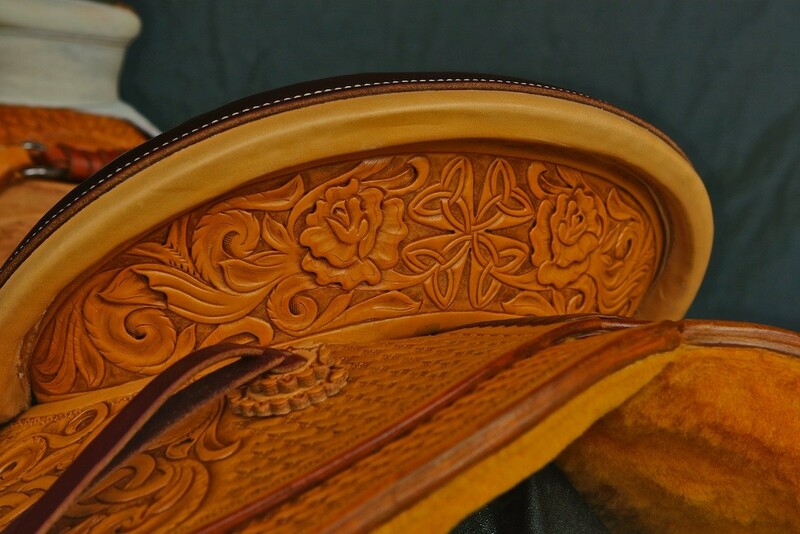 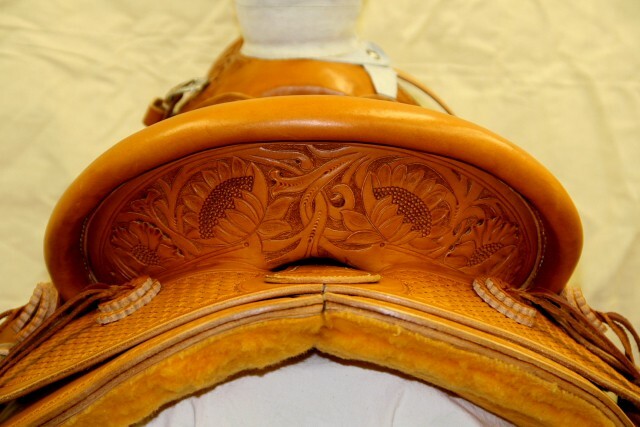 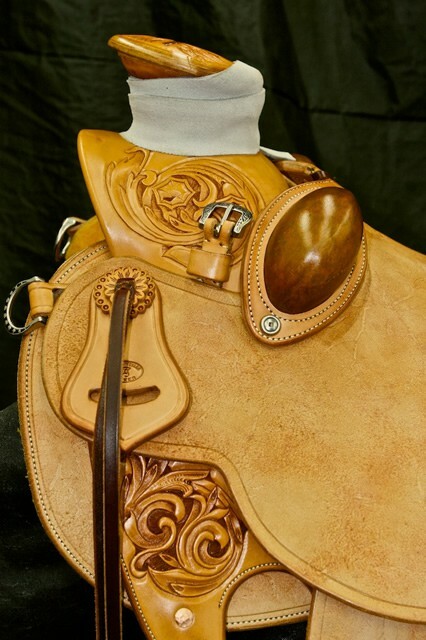 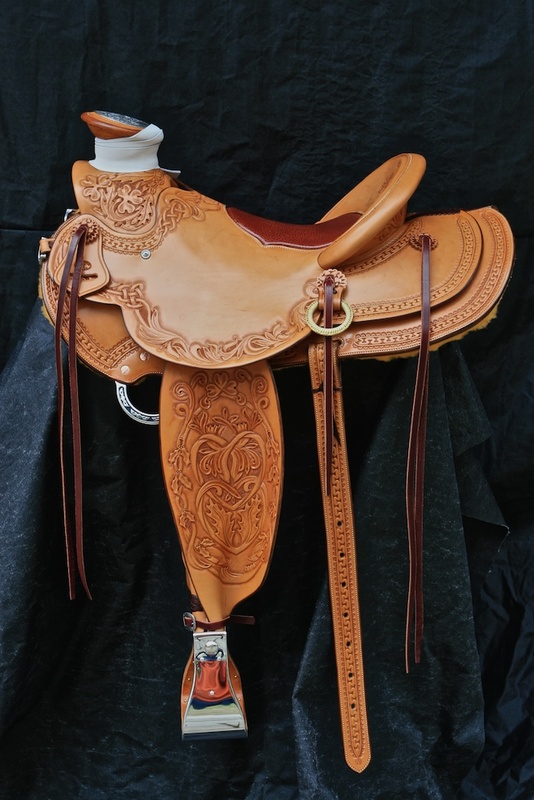 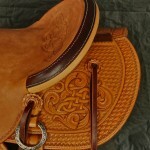 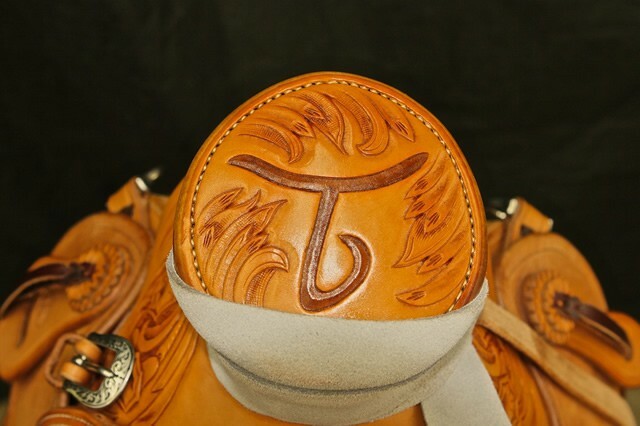 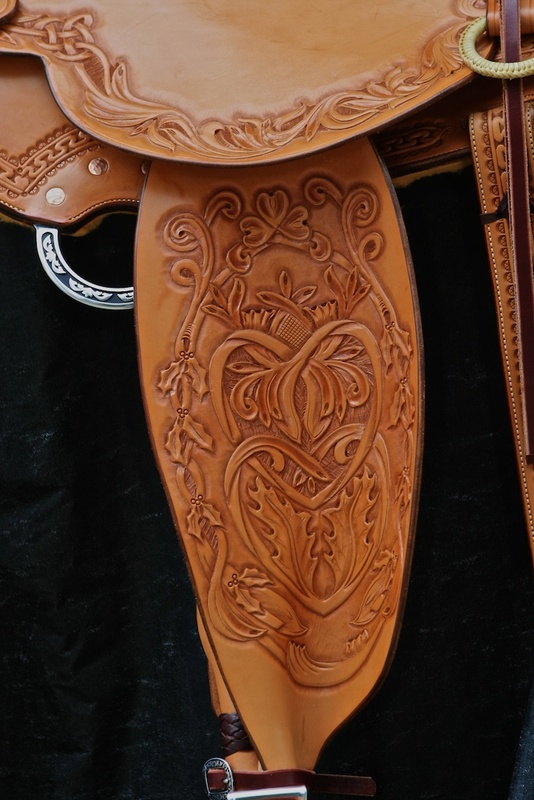 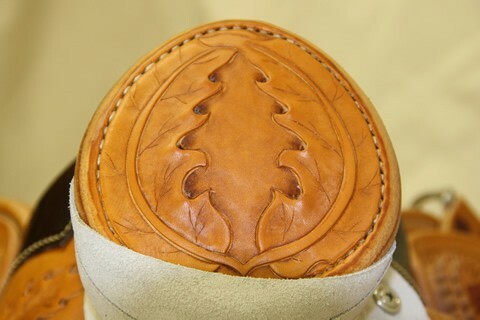 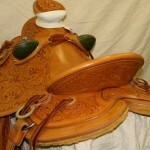 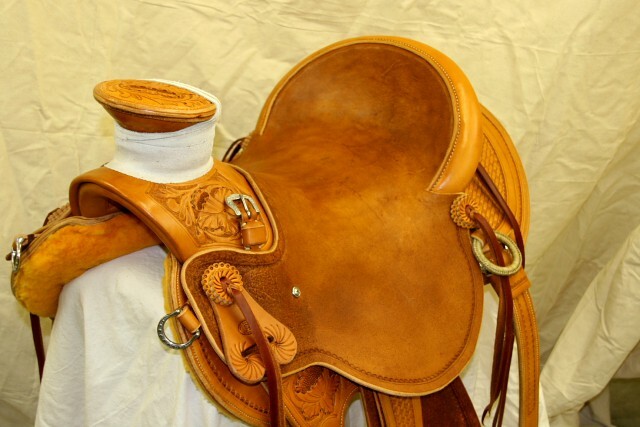 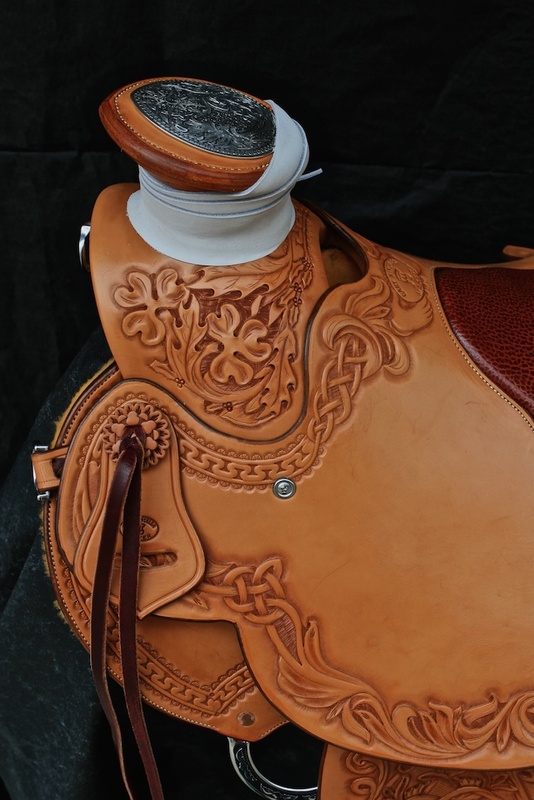 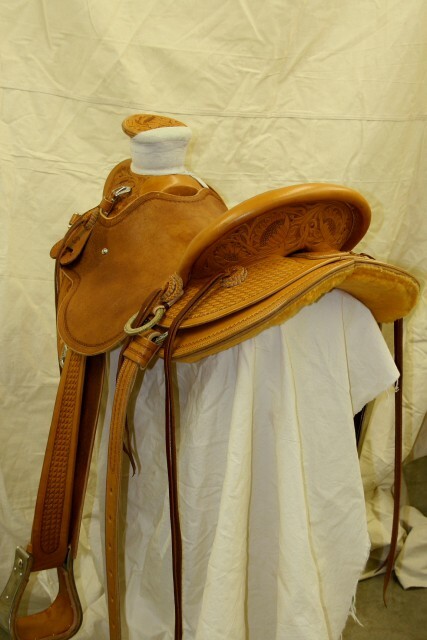 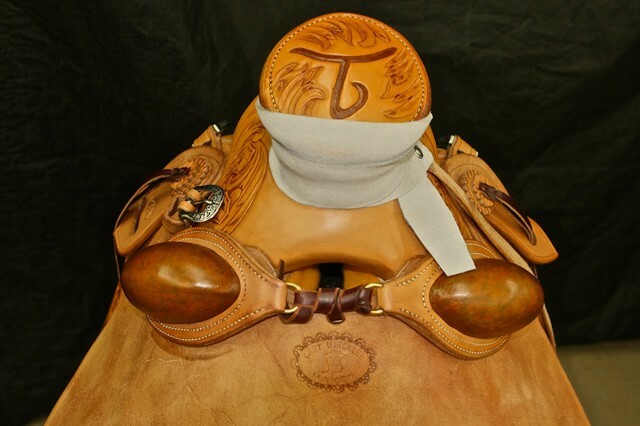 This saddle was built on a Will James tree with a 14 1/2″ swell and a 5″ x 11″ cantle. 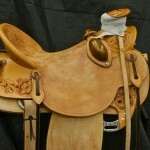 We used an in-skirt rigging on this saddle set at 7/8 position. 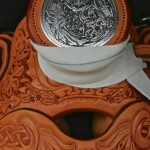 The wood post horn is 3″ x 3 1/2″ Guadalajara. 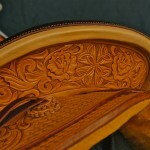 The swell was covered without a seam. 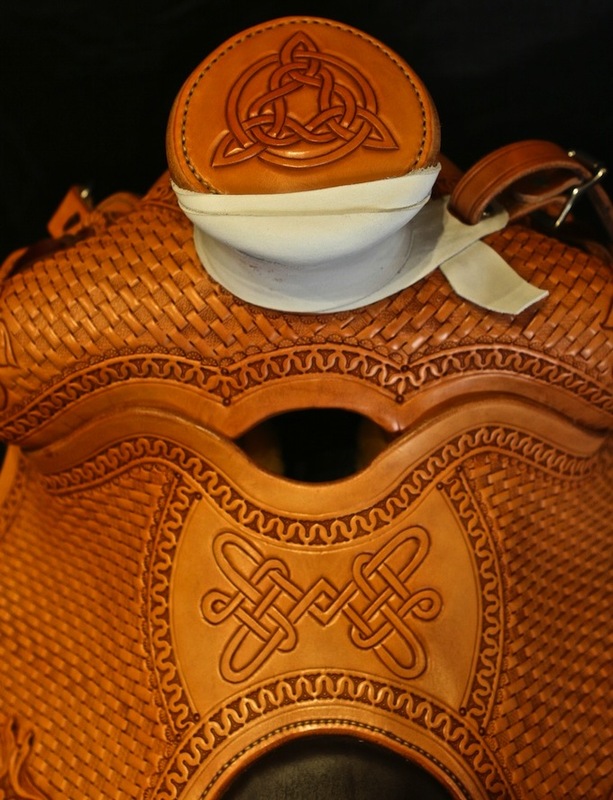 Kris Keefe wanted something functional, yet symbolic of her family history and tradition. 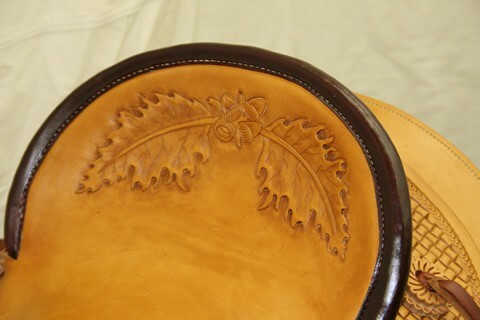 This Wade was inspired by her ideas and my interpretation of them in leather. 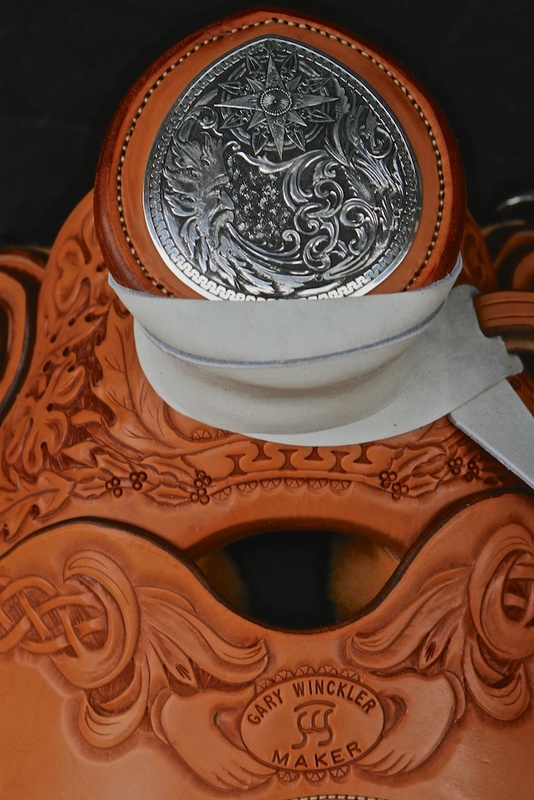 Thanks to Richard Brooks for the great silver horn cap. 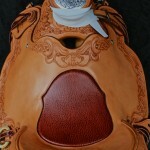 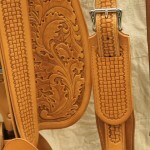 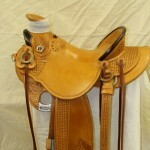 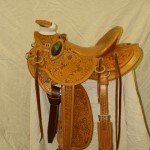 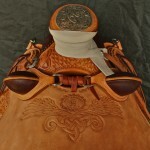 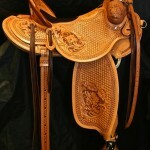 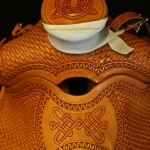 This saddle was built on a Wade saddle tree by Rod Nikkel. 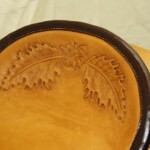 It is a 15″ seat on a 4 x 90 tree. 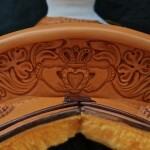 The cantle and swell cover are bound with red rawhide and motif is oak leaves. 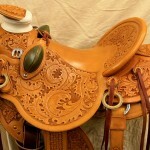 Saddle hardware is by Jeremiah Watt. 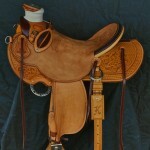 Thanks to Dale Hicks of Monticello, IL for the opportunity to build this Bowman Roper. 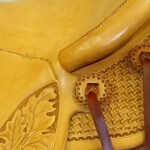 The tree is by Rod Nikkel and hardware by Jeremiah Watt. 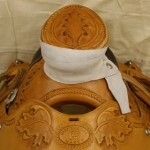 The horn is a #4 Hamley and the saddle was done with a barb wire border combined with a crazy stamp and oak leaf tooling. 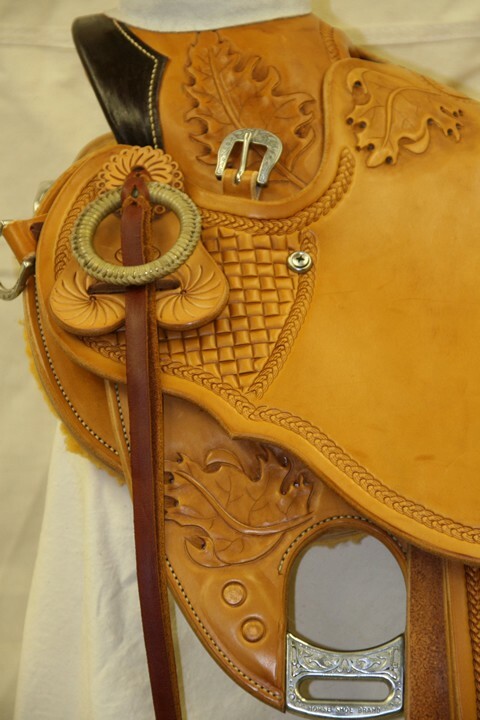 Built for Bobby Tarbell of Visalia, CA, this is a Rod Nikkel tree with Jeremiah Watt Products hardware. 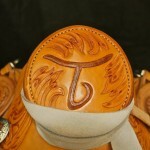 The scrollwork features his Tarbell brand.